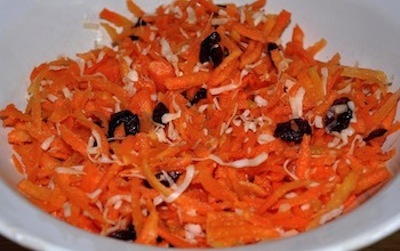 Simple carrot salad recipe that you can change to suit your family's taste. Shred carrots. Add to serving bowl. Stir in raisins. Add mayonnaise and plain yogurt. Stir to combine. 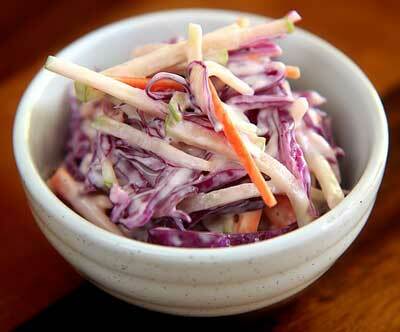 **You can add other shredded vegetables like cabbage. Add carrots, coconut and craisins together in serving bowl. Drizzle with honey and toss to coat. Add ingredients to serving bowl. Drizzle with olive oil and salt and pepper. Add Craisins in place of raisins. Add a sprinkle of ginger. Add 1/2-1 teaspoon sugar or honey. Boil carrots in orange juice for more flavor and more tender carrots. Add a dash of hot sauce. Use olive oil and lemon juice in place of mayo and yogurt. 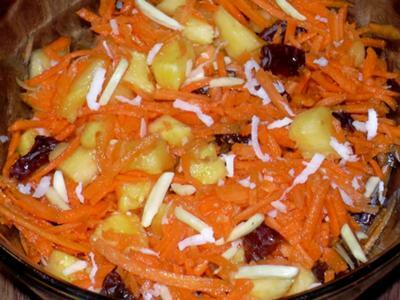 Place shredded carrots, pineapple, raisins and coconut in serving bowl. In a glass or measuring cup stir together mayonnaise and pineapple juice*. Pour over carrot salad and chill. Before serving add nuts. Mix all ingredients together. Tastes better if served chilled. 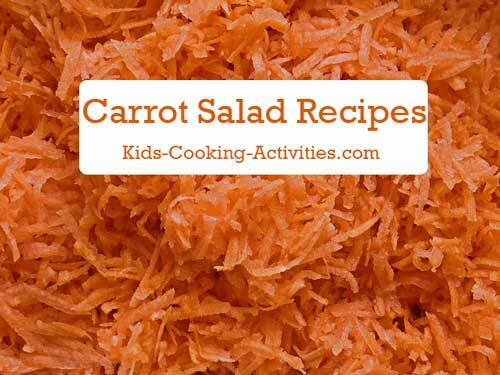 Kids love this simple carrot salad recipe. Its colorful & crunchy. At the same time, its extremely healthy & a rich source of Vitamin A, C, fiber & antioxidants. 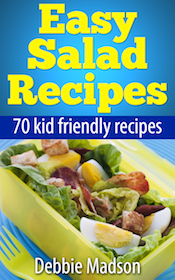 Kids could also help you make this salad. Its my own creation. I would be happy if you could also try it & let me know your feedback. In a big bowl, mix sprouted mung, cucumber, carrot, ginger, cilantro, pomegranate seeds & lemon juice. Now roast the noodles along with sesame seeds. Add this roasted mixture in the bowl and mix together. At last add olive oil. Mix well & the salad is ready to eat.